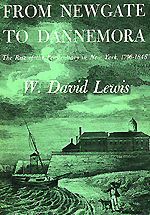 NYCHS presents excerpts from From Newgate to Dannemora: The Rise of the Penitentiary in New York, 1796-1848, by W. David Lewis. Copyright © 1965 by Cornell University; copyright renewed 1993. Used by permission of the author and the publisher, Cornell University Press. All rights reserved. Click on image, based on book jacket front cover, to access Cornell University Press site. The legislation which Thomas Eddy secured in 1796 provided for two state penitentiaries. One of these was to be built at Albany under the supervision of a committee which included Philip Schuyler. The other was to be constructed in New York City by Eddy and his associates. Less than a year later, however, the Albany plan was abandoned, possibly because it was believed that the number of convicts from upstate areas would be small and that one prison would therefore suffice. “Newgate,” which rose in Greenwich Village on the east bank of the Hudson about a mile and a half from City Hall, was for nearly two decades to be the only institution receiving felons convicted under the new penal code. . . .
As could be expected, Eddy leaned heavily on the experience of Pennsylvania in constructing New York’s first penitentiary. In April, 1796, he wrote for advice to Caleb Lownes, a Quaker iron merchant who was an inspector of the Walnut Street jail. . . . It is not surprising, therefore, that Newgate when completed showed a considerable similarity to the Walnut Street Jail. In each institution, two wings containing quarters for inmates extended backward from a central structure housing administrative offices. The image above is based on one appearing in From Newgate to Dannemora on an unnumbered page facing Page 16. The caption reads, in part: "Ground plan of Newgate, 1797. From an engraving . . . (1801). Reprinted by courtesy of the New-York Historical Society." Red letters have been added to this NYCHS digital version of the image to indicate the location of specific features of the facility. A - Prison Wharf on the Hudson. B - Work Shops inside prison wall. C & D - Watch Towers. E & F -- Solitary Cells. H - Wood & Lumber Yard. I - Convicts Eating Room. K - House of Worship. L - To left of "L" was the Inspectors Room. L - To right of "L" was the Keepers Room. At the New York prison, solitary cells for the worst offenders were placed in the rear portions of the wings; at Philadelphia, they were put in a separate building altogether. At both institutions, workshops were erected behind the main prison complex. In some important respects, however, Newgate was different from its Pennsylvania prototype. 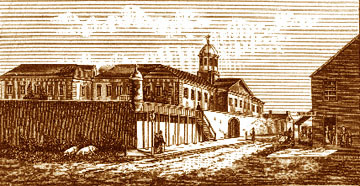 Unlike the Walnut Street Jail, which contained accommodations for vagrants, suspects, and debtors, Eddy’s penitentiary was from the beginning designed and constructed for felons only. It was also provided with a large room for public worship, whereas the Philadelphia establishment had been built before it was thought advisable to hold religious exercises among criminals. Eddy’s correspondence makes it clear that he considered Howard's writings on prisons while supervising the construction of Newgate. Nevertheless, he disregarded Howard’s idea that it was necessary to keep convicts in solitary confinement at night, much to his later regret. The Thomas Eddy image above is based on one appearing in From Newgate to Dannemora on an unnumbered page facing the title page. The caption reads, in part: "Thomas Eddy, 1758 - 1827, New York's first significant prison reformer. 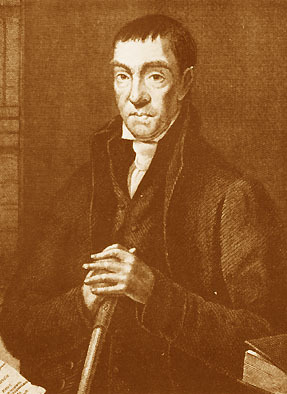 From an engraving in Samuel I. Knapp, The Life of Thomas Eddy (1834). Reprinted by courtesy of the New-York Historical Society." His decision to allow inmates to mingle even during sleeping hours was probably influenced by the confidence which Lownes expressed in the state of discipline at the Walnut Street Jail, where nighttime separation did not occur except among the most hardened or refractory prisoners. 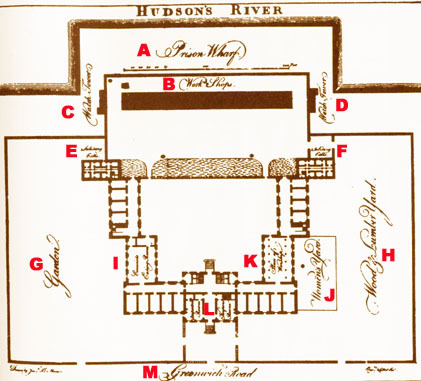 At the completed New York institution, most convicts were housed in fifty-four apartments with dimensions of twelve by eighteen feet, designed to accommodate eight occupants each. Eddy not only designed Newgate, but also became its first agent, a position roughly corresponding to that of today’s warden. He brought to his new assignment a philosophy which was both stern and humanitarian. On the other hand, he held that no two inmates were alike, and that it would be a mistake to treat convicts as if they had been formed in one common mold. Along with Caleb Lownes, he believed that inmates fell into three broad categories: hardened offenders; criminals who, though depraved, still retained some sense of virtue; and young persons convicted for the first time. The existence of such varied types called for individualized treatment. Caption reads, in part: "Front elevation ... of Newgate 1797. From an engraving . . . (1801). Reprinted by courtesy of the New-York Historical Society." To Eddy’s mind, the reformation of the offender was the chief end of punishment. In order to promote rehabilitation he encouraged religious worship and established a night school. In the latter, he restricted the classes to the well-behaved as an incentive to good deportment, and charged the students four shillings’ worth of extra labor to inculcate thrift. He was disinclined to rely on fear and severity, and approved warmly of provisions in the law of 1796 which prohibited corporal punishment at Newgate. The image above does not appear From Newgate to Dannemora. An illustration from the period, it depicts an scene outside the penitentiary wall, looking north up Greenwich Street. Note the wall stairs. Also note two pigs in shadow at the foot of the wall. Pigs were permitted on the streets as a kind of 4-legged sanitation workers. They ate garbage left for them. Hog fill, not landfill. His chief disciplinary weapon was solitary confinement on stinted rations, and he forbade his keepers, who were unarmed, to strike convicts. He allowed well-behaved inmates to have a supervised visit with their wives and relatives once every three months, and saw that his charges were given a coarse but ample diet. Despite his emphasis upon humanitarian treatment, Eddy stripped the regime at Newgate of anything resembling frills or self-indulgence. As soon as an incoming inmate had been bathed, provisioned, and interrogated, he was assigned to a prison shop and made to realize that his convict life would be one of hard work. It took two years to complete enough shops to provide full employment, but under Eddy’s frugal and efficient management the penitentiary soon became a relatively prosperous industrial unit. Shoemaking was the first trade to be inaugurated, followed by the production of nails, barrels, linen and woolen cloth, wearing apparel, and woodenware. The Pennsylvania coat of arms image above and the image below of the Pennsylvania Flag incorporating the coat of arms do not appear in From Newgate to Dannemora. They do appear on the Pennsylvania Historical and Museum Commission (PHMC) web site. There they help illustrate information about the design of the coat of arms for the state by Caleb Lownes, an iron merchant, a civic hero for his work combating yellow fever, and a prison reform leader to whom Thomas Eddy turned for advice. Click either image to access the PHMC site. By 1803, the profits of the Newgate shops actually yielded a tiny surplus after the prison’s expenses had been paid. It is a tribute to Eddy’s skill in handling men that he was able to employ a working force consisting of many who were “hardened, desperate, and refractory, and many ignorant, or incapacitated through infirmity and disease,” and achieve satisfactory results. He did this, interestingly enough, without imposing the harsh and unmitigated slavery which later came to characterize penal labor under the Auburn system. Each convict at Newgate was charged a set amount upon the prison books for his clothes and maintenance, and accounts were kept of the proceeds from his labor. If he compiled a good behavior record, he was given upon release a share of the profits he had helped to earn. Inmates who demonstrated capacity and skill were used as superintendents and foremen in the shops. Indeed, the inauguration of shoemaking was made possible by a convict who had been a cobbler and who instructed his fellow prisoners in the trade. Despite the incentives which Eddy held out to those who conformed, it was not easy to maintain order. In 1799, guards were forced to open fire when fifty or sixty men revolted and seized their keepers. Several felons were wounded before the mutiny was quelled. In 1800, the assistance of the military was necessary to break up a riot. . . .
April 4, 1803, twenty inmates tried to scale the walls in an effort to escape. After ordering them to desist without avail, prison guards opened fire and killed four convicts, one of whom was an innocent bystander. . . . Some new inspectors were appointed in 1803, and [Eddy] found himself unable to get along with them. The root of the difficulty is not entirely clear, but it appears that the Jeffersonians wrested control of the prison from the Federalists. Since Eddy belonged to the latter party, political differences may have contributed to the dissension. The Quaker agent also differed with his associates over economic matters, and it is likely that the introduction of a contract labor system in the shoemaking shop aroused his displeasure. By January, 1804, the situation had become so unpleasant that he resigned. . . .
Late in 1805, he indicated once more that developments at the penitentiary were not to his liking. Despite the existence there of cleanliness and good order, he disapproved of the severity of the discipline, and pointed out that industrial profits had declined since the days when he had been in office. In subsequent years Newgate became more and more of a disappointment to the state, and Eddy’s pessimism was vindicated. . . . . . . To say this is not to detract from Eddy’s stature as a prison reformer, nor unduly to criticize those who had helped him to establish the penitentiary, but rather to affirm that these men were not omniscient. Some things had to be learned from experience.